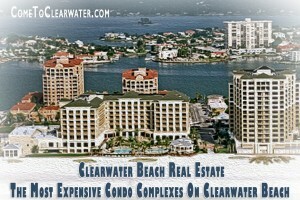 Clearwater Beach has great real estate, from affordable to posh condos right on the beach. 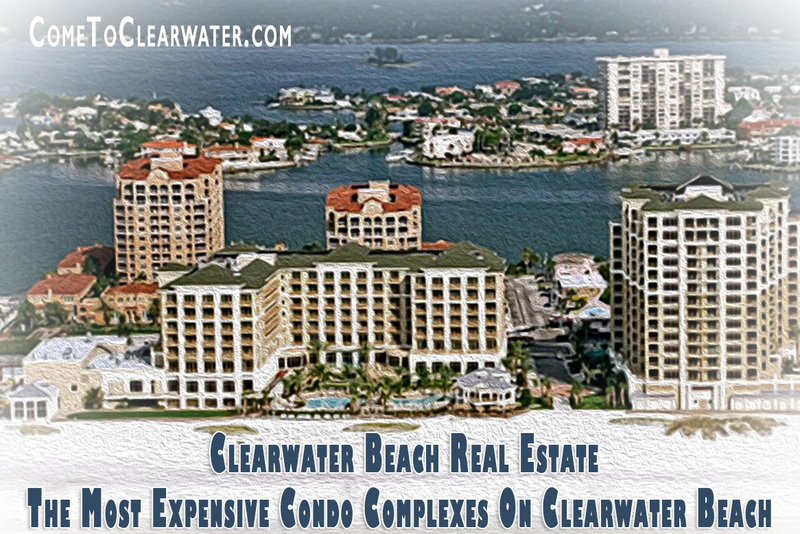 In fact, some of the most expensive real estate is condo complexes on Clearwater Beach. Here are some of them. Sandpearl: The condos at Sandpearl are luxury on the water. One example of a unit here has 3 bedrooms and 3.5 baths with amazing views of the Gulf of Mexico. It also includes a wine cellar marble floors, a gourmet chef’s kitchen and open concept to the living room and dining room. There is a terrace off the kitchen, living room, with a custom wall unit with 3 TV’s, master suite with a custom bed and built ins, and a private cabana by the pool. Community amenities include a concierge, 24 hour security, pool and spa, outdoor cabanas, social room, boardroom, fitness with steam and sauna. Condos at 1350 Gulf Boulevard: These condos are also on Sand Key. Contemporary design with Gulf front views. Condos have over 60 feet of direct gulf front balcony space and the bedrooms each have views overlooking the intracoastal! Units have a double master suite with his and her full private baths and walk in closets, a large kitchen, bar area, family room and formal entertaining areas. They also have 2 utility rooms, 4 bedrooms (not including the master) and gorgeous baths. The community amenities include a fitness center, clubhouse, meeting room, heated pool, spa and more. The Grande at Sand Key: These beautiful condos have Gulf front views and 5,150 square feet of amazing luxury. Each unit has over 800 square feet of outdoor terrace. The Gulf isn’t the only view either, you will have panoramic views of the Gulf and coastline from Clearwater Harbor up to Tampa. Units have travertine flooring, volume ceilings, granite counter-tops, california closets, open floor plans with multiple living areas, three master suites and a private access elevator with a private over-sized two car garage. The community offers a 24-hour manned gatehouse entry, private beach access, heated beach pool and cabanas overlooking the Gulf, an outdoor spa and heated lap pool, gas grills, fitness center complete with steam room and sauna, two har-tru tennis courts and on-site concierge services. These are just a few, but if you want to treat yourself to the best, contact a Realtor like Deb, the Irish Realtor today!